Interview of the GS of the CC of KKE Dimitris Koutsoumbas on the ERT1 public television channel, on 24/10. Below are extended excerpts from the interview. Source: inter.kke.gr. - I read the following in “Rizospastis”: The day when the government begins the discussion with the “institutions” (Troika) about the new attack against working and trade union rights, SYRIZA and ND choose to squabble about their favourites and also about the misleading issue of corruption in order to hide their convergence on the antiworker measures. Is corruption a misleading issue? Can you explain this? Doesn't this issue objectively exist in our lives? - The issue of corruption always exists in our lives, exists in this system, exists in the state. Our evaluation is that it is the state which has decayed, that the political system has been corrupted more generally. Therefore, it is a real issue, but it is utilized every time when the parties which are in power, the government and the respective official opposition, and want to confront each other around such issues in order to hide the big problem, the “forest”- the peoples' problems, the antiworker and antipeople measures that they are discussing in this period with their partners (Troika)- because they aren't the partners of the Greek people- the creditors in order to bring new measures, possibly a new memorandum as well. This is the essence of the whole confrontation. Because, from now on, in this system, with these measures, with these governments, with those who have the power, neither corruption will be confronted, nor the problems solved. We saw it also regarding the TV license issue, we saw it with the successive laws they have passed which, regarding the supposed offensive against corruption, or, for example, the issue of transparency, ended in total failure, both those of the previous (governments) and the present one. Let me tell you this simply: The representatives of ND and PASOK are servants of some interests, owners of TV channels I mean, and the current governmental majority of SYRIZA-ANEL is servant of some other owners and interests. - I didn't say that he has decided to collide. I said that he has decided to serve some other interests. - Yes, but the knives have come out. Therefore, at this conjuncture some evaluate that the stance that the KKE follows, to lump them all in together, is a tactic that helps ND. That, your ideological position “the liars who applied these, he told us one thing and did another etc.” becomes dominant, as if, they say, you are interested in the application of SYRIZA's promises.... and within this context they say that the KKE is trapped and follows the same rhetoric, i.e. that the opposition approach of ND becomes the hegemonic direction. - This supposed argument is well-known, it comes from the very past and we believe that our people have gained significant enough experience. It is the same line that PASOK used in the past, when it was in the opposition, when it was the “light and darkness” division, when it wasn't in governmental coalition with ND, where PASOK then, with G.Papandreou and others before him, was saying that the KKE plays the role of ND. It is the same old story. When a party becomes a government, it later argues that KKE or the opposition agrees with some other party, simple as that. It is the other side of the same coin. 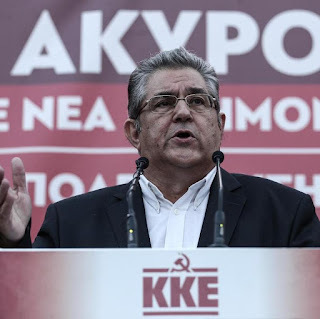 The argument that you say, that “by criticizing SYRIZA, the KKE supports ND”, exists, which is ridiculous, because the KKE fought against ND steadfastly, as it does now. As you have seen, we talk about bipolarity, criticizing both respectively, because they follow the same direction. 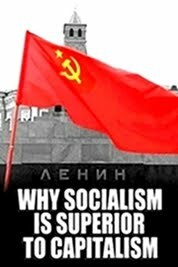 - Naturally, KKE will criticize, this is obvious, it has a different ideological starting point and defends specific interests. What I ask is different. They argue that through this way, the right-wing view becomes a hegemonic ideology which talks about the rationalization of the state, that it can become better, that the bad people should leave and the better ones should come. Thus, they change the political agenda at the core of politics. - This doesn't have anything to do with KKE, but with criticism we also direct towards ND. Rationalization of the state and productive reconstruction, with the same owners and the same people who have the power, cannot be done. A substantial change in the political system and a reform of the state, through partial measures, like the current government does or as ND says that will do, cannot be done. The notion that must prevail in the Greek people, in the movement, but also in the very consciousness of the workers is that all these things require a fundamental overthrow, they need radical changes, actual revolutionary changes, but not in words. Such revolutions and overthrows in words, we had before the elections like those of Mr.Tsipras and SYRIZA and Mr.Kammenos and ANEL, even before them we had G.Papandreou of PASOK, others in ND etc. 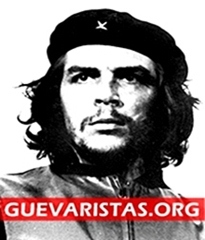 Everyone talks about revolution in society, for fundamental radical changes of the state. What needs here is another programme, another perspective, there is a need for another course to be charted, not in an improvised way, but with a plan. 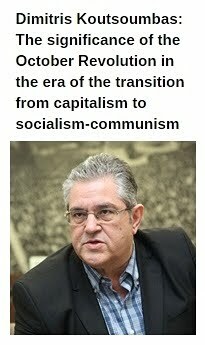 The KKE has such a plan and proposes it to the Greek people. They say “it seems difficult”. But why, is it easy to live as we do now? So many measures have come, memorandums, a 4th memorandum is being prepared now, new measures are coming, the people are bleeding daily from these, from the taxation, the incomes of every Greek worker have been decreased, the farmers also suffer and are being driven off their land. We cannot always invoke some difficulties, or that the political proposal of a party is difficult and another one is easy. Such easiness is known to us too. You don't have to be particularly intelligent in order to practice the easiness of mockery and lies. As, for example, the governmental parties did, which rule today and which in past received 4% of the vote-they fooled the Greek people with revolutionary slogans and we have seen what they have done. We warned the people then. Therefore, this isn't enough, the peoples' consciousness must work towards this direction and the workers must struggle around these issues. Recently, I am hearing various things, from circles of the Church as well as from political persons, leaders, etc, that “we must find consensus, we must reach out with our hands”. But, of course, the KKE extends its hand to the worker, the farmer, the self-employed, the popular family, to the people who suffer and all together must be united, but this needs a raised fist, because the fist symbolizes the struggle, the demands. Without struggles and demands, nothing can be achieved. You can't say “let us all agree and we will all be fine”. This is preaching from the pulpit and when this is said by political persons or people who have prestige within Greek society, it becomes dangerous. They actually act, without perhaps realizing it themselves, against what we call resistance, struggle, fight for radical changes. - Mr.Koutsoumbas, the trailer of our interview was playing for a whole week. 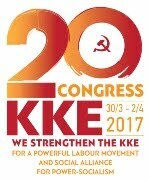 Yesterday, at the cafe, someone told me, in good faith, to ask you a question: “I believe in the overthrow that the KKE talks about, but until it comes, in the Armageddon that we live now- while others come and talk about the 'under-minimum salary'- why doesn't the KKE lend a hand until the revolution comes? - Not only do we lend a hand, but also legs and arms. You know, a few days ago, to answer your friend, a major mobilization-demonstration took place, which came about from work in the workplaces, in the unions. 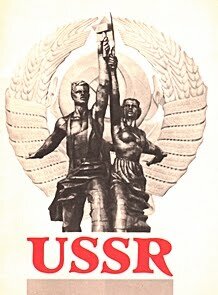 Over 500 trade union organizations, primary and secondary level unions, federations and labour centers created a draft law, which they discussed with the workers themselves, and which refers to the needs of today, to the Collective Labour Agreements, not to the total overthrow of the system and Socialism. Of course, , the trade unions and everyone, must work in this direction, but this specific draft law referred to the Collective Labour Agreements, to the minimum wage, to a number of labour rights that have been taken away (…). This draft law was submitted to all the political parties in Parliament, as well as to our party. 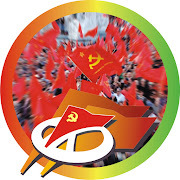 However, the KKE was the only party which submitted this draft law in order to become a decision of Parliament. The other parties and the government turned their backs on it. - In any case, the so-called “left” of SYRIZA, here in Greece, not only moves in this direction but, in our opinion, it has already crystallized as a social democratic party, a clearly bourgeois party. It takes more and more, if not completely, the position of PASOK and moves, driven by the decisions of its recent congress, to occupy the whole space of the center-left; this creates difficulties for other parties of the opposition, such as PASOK, Potami, Centre Union which are moving in this center-left space. Because SYRIZA occupies this space and this is what it intends to do. I don't know if it will succeed (to occupy the whole center-left space). In the end, that will depend on many other factors and parameters, but it moves in this direction and this has crystallized (as is perfectly clear). 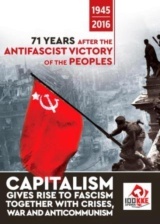 Besides, it is no coincidence that (SYRIZA) more and more often participates in meetings and caucuses of Socialists in Europe, of European social democracy, has close ties with Hollande and others who also apply respective antipeople-antiworker policies in their countries, even without memorandums. It is the same direction of the EU and the Quartet. And from this point of view, SYRZA and Mr. Tsipras personally are moving rapidly towards this direction. However, the people have experienced these policies, they are the same policies which in the past led PASOK to form a coalition with ND, to a continuous change of positions and to a collapse, which SYRIZA will obviously follow in the next period. - Do you think that such a possibility exists? I mean, in order to overcome the national problems, as they call them, that the two big parties can form a coalition? Do you see this as a possibility? Look, the loss of SYRIZA's forces can been seen inside the trade unions, associations, in the workplaces, in the elections in trade unions, in the struggles, the neighborhoods, where a large amount of resentment has developed over the last year, as a result of SYRIZA's governmental policies; this discontent isn't being reaped by ND. That can be seen also in opinion polls. - Does this resentment go somewhere? - There is a large mass of people who are currently worried, thinking, discontent with the policies of SYRIZA and, at the same time, they are unhappy because they have experienced the policies of ND and they don't want to go back neither to ND or to PASOK which they have also experienced for many years; these people are worried, indignant, participate in the struggles. That is expressed in the elections in the trade unions of the private and public sectors. The forces which KKE supports are the second largest with votes of over 20% within the broader trade union movement, in the associations of women, the youth, in the students unions and school-student councils- for younger ages, as the school-students of the two last high school classes will now vote under the new law- and of course (KKE has) a large influence amongst farmers. To these people, who are more than 20%, the ones we meet in the struggles, the ones who in the past voted SYRIZA, PASOK and others possibly ND or other smaller parties as a gesture of dissatisfaction, we say to them to join with the KKE, despite their reservations. Because, it is the only proposal which can provide a way out for today but also to pave the way for a better future. And this proposal must be strengthened everywhere and within the movement, but also whenever elections take place, either national elections, local ones or Europarliamentary elections. THE INTERVIEW IN RUSSIAN LANGUAGE. Народное недовольство может найти выход в поддержке политического предложения КПГ. 24 октября Генеральный Секретарь ЦК КПГ Димитрис Куцумбас дал интервью государственному каналу ERT1. Ниже следуют обширные отрывки из интервью. -- Читаю в "Ризоспастисе" следующее: «В те дни, когда правительство начинает переговоры с кредиторами, предусматривающие нанесение нового удара по трудовым и профсоюзным правам, СИРИЗА и НД вступают в конфронтацию вокруг своего излюбленного и в то же время дезориентирующего вопроса, для того чтобы скрыть свое идентичное отношение к реализации антирабочих мер. Так, значит, вопрос о коррупции является дезориентирующим вопросом? Могли бы Вы нам это объяснить? Разве этот вопрос объективно не существует в нашей жизни? -- Коррупция всегда имеет место в нашей жизни, в этой капиталистической системе, в государстве. По нашей оценке, это государство прогнило насквозь, политическая система полностью коррумпирована. Значит, коррупция - это реальная проблема. Однако каждый раз она используется тогда, когда этого хотят партии власти, правительство и любая оппозиция, чтобы за противостоянием вокруг такого рода вопросов скрыть большую проблему: проблемы, с которыми сталкивается народ, антирабочие и антинародные меры, которые обсуждает правительство в эти дни со своими партнерами, но не партнерами греческого народа, кредиторами, чтобы принять новые меры и, возможно, новый меморандум. На простом языке это звучит так: представители НД и ПАСОК обслуживают интересы одних владельцев телеканалов, а сегодняшнее правительственное большинство СИРИЗА-AНЭЛ обслуживает интересы других владельцев. -- Я не говорил, что он решил идти на столкновение. Я сказал, что он решил обслуживать интересы других предпринимательских групп. -- Да, но клинки обнажаются. Но в данный момент, по их мнению, такая позиция недооценки усилий, прилагающих правительством, которой следует КПГ, является тактикой, которая помогает НД. То есть тезис вашей господствующей идеологической концепции заключается в том, что «нами правят лгуны», что «они нам говорили одно, а делают другое» и т.д. В этом контексте они говорят, что КПГ, как и правая партия НД, зацикливается на одном и том же и продолжает ту же риторику. -- Нам известен этот якобы аргумент, он очень старый, и мы считаем, что наш народ накопил достаточно большой опыт и разбирается в этом. То же самое раньше говорила партия ПАСОК, когда была в оппозиции, когда было разделение на "свет и тьму", когда она не была еще в правящей коалиции с НД. Тогда ПАСОК с Г. Папандреу и другими говорили, что КПГ играет роль НД. Это та же самая история. Когда партия становится правительственной, она начинает говорить о КПГ или об оппозиции, что та примыкает к другой партии. Именно так и происходит. Это другая сторона одной медали. 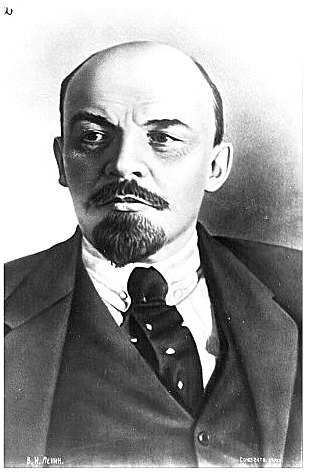 Да, приводится аргумент о том, что "КПГ, критикуя СИРИЗА, поддерживает НД", который является смешным, так как КПГ твердо выступала и выступает сегодня против НД. Как вы видите, мы говорим о биполярности, критикуя аналогичным образом и тех и других, потому что они проводят одну и ту же политику. -- Безусловно, КПГ будет продолжать критиковать, это очевидно, так как у нее иная отправная точка идеологии, и она защищает определенные интересы. Но я спрашиваю о другом. Утверждают, что таким образом в качестве идеологии, в качестве идеологемы преобладает правый подход в отношении рационализации государства, что оно может стать лучше, уйдут плохие и придут хорошие. Т.е. по существу, правые меняют политическую повестку дня. -- Это не касается КПГ. Мы также подвергаем критике НД. Рационализация государства, производственная реорганизация с теми же собственниками и с теми, кто стоит у власти, не может произойти. Политическая система не может существенно измениться, а государство реформироваться с помощью частичных мер, которые внедряет нынешнее правительство или будет внедрять НД, согласно ее заявлениям. В сознании греческого народа, трудящихся, в народном движении должно преобладать понимание того, что все это необходимо принципиально изменить, нужны радикальные изменения, существенные революционные изменения, но не на словах. Так как с такими революциями и переворотами на словах мы познакомились во время предвыборной кампании г-на Ципраса и СИРИЗА, а также г-на Камменоса и АНЭЛ, раньше о них говорил Г. Папандреу из ПАСОК и другие до прихода НД и т.д. Все говорят о революции в обществе, о принципиальных радикальных изменениях в политике государства. Здесь необходима иная программа, иная перспектива, необходимо наметить другой путь, а не так, шаляй-валяй, нужен план. Такой план есть у КПГ, и она его предлагает греческому народу. Говорят: «он кажется трудным». А что разве сегодня наша жизнь легкая? Столько мер, меморандумов приняли, сейчас готовится 4-й меморандум, готовятся принять новые меры, народ ежедневно страдает из-за них, из-за налогообложения, доходы греческих трудящихся снизились, крестьяне тоже бедствуют и разоряются. Невозможно всегда говорить о каких-то трудностях или о том, что политическое предложение одной партии трудное, а другой - легкое. Мы знаем такую легкость. Легкость лжи. Не надо быть особенно умным, чтобы с легкостью применить ложь. Так, например, поступили правящие партии, находящиеся сегодня у власти, а до этого на выборах получавшие 4% голосов, которые одурачили греческий народ лозунгами за коренные перемены, за революционные изменения. Мы видим, до чего они докатились. Тогда мы предупреждали. Значит, недостаточно только общих слов о революции, нужно, чтобы сознание народа работало в этом направлении и трудящиеся боролись за решение этих проблем. В последнее время слышатся разные призывы церкви и политиков, лидеров партий и др. к согласию и оказанию друг другу помощи. Безусловно, КПГ протягивает руку помощи рабочему, крестьянину, самозанятым работникам, народной семье, людям, которые бедствуют, и призывает всем вместе объединиться, поднять руку, сжатую в кулак, так как кулак, символизирует борьбу, отстаивание своих прав. Ничего нельзя добиться без борьбы. Мы не можем говорить: "Давайте придем к согласию, и все у нас будет в порядке". Это проповедь с амвона, и когда ее произносят политические деятели или лица, пользующиеся авторитетом в греческом обществе, то это представляет опасность. По существу, возможно, сами этого не осознавая, они выступают против того, что мы называем сопротивлением, борьбой, борьбой за радикальные изменения. -- Г-н Куцумбас, все выходные крутился рекламный видеоролик о том, что вы дадите интервью нашему каналу. Вчера в кафе некто из добрых побуждений спросил меня: "Я верю в то, о чем говорит КПГ, но мы живем во времена Армагеддона, когда приходят кредиторы и говорят о снижении минимальной зарплаты, почему КПГ не подставляет плечо, пока не наступит эта революция?" -- Мы не только подставляем плечо, но и протягиваем руку помощи. Вам известно, что несколько дней назад (скажите об этом своему другу) прошел массовый митинг, который явился результатом работы на производстве, в профсоюзах. Более 500 профсоюзных организаций, первичных, вторичных профсоюзов, федераций, рабочих центров подготовили законопроект, который обсуждался с трудящимися. Этот законопроект касался сегодняшнего дня, коллективных трудовых договоров, он не касался радикальных изменений и социализма. Безусловно, всем нам, профсоюзам надо работать в этом направлении, но законопроект касался коллективных трудовых договоров, минимального размера зарплаты, ряда трудовых прав, которые были нарушены и которые необходимо восстановить. Этот законопроект был роздан представителям всех политических партий в парламенте и нашей партии. Но только КПГ внесла его на утверждение в парламент. Остальные партии и правительство отмахнулись от него. Так, получается, вы мне говорите, что мы не боремся за решение повседневных проблем или сегодняшних проблем. Сегодняшние проблемы и борьба за их решение открывает путь для решения завтрашних проблем, и когда все это сочетаешь, а не дурачишь греческий народ, утверждая, что можешь с правительственных постов или с позиции оппозиции разрешить неприемлемую ситуацию, которая постоянно заставляет наш народ страдать, так как капиталистическая система прогнила и кровоточит. -- Во всяком случае, так называемая левая СИРИЗА, здесь, в Греции, не только движется в этом направлении, но, по нашему мнению, выкристаллизовалась в чисто буржуазную социал-демократическую партию. Она все больше, можно сказать, полностью, занимает место ПАСОК и, согласно решениям недавнего съезда, стремится завоевать все левоцентристское пространство, что создает трудности для других оппозиционных партий, таких как ПАСОК, Потами, Союз центристов, которые двигаются в этом левоцентристском пространстве. Поэтому СИРИЗА стремится занять это пространство. Я не знаю, удастся ли ей в итоге это сделать. Это будет зависеть от многих других факторов и параметров, но она движется в этом направлении и уже выкристаллизовалась в социал-демократическую партию. Впрочем, не случайно она все чаще принимает участие в конференциях и совещаниях социалистов в Европе, европейской социал-демократии, имеет тесные отношения с Олландом и другими, с теми, кто реализует аналогичную антинародную, антирабочую политику в своих странах, которым не навязан меморандум. Это одно и то же направление ЕС и квартета кредиторов. И с этой точки зрения, СИРИЗА и лично г-н Ципрас быстрыми темпами движется в этом направлении. Но такая политика знакома народу, это та же политика, которая ранее привела ПАСОК к коалиционному сотрудничеству с НД, к последующему изменению позиций и краху, который, очевидно, потерпит СИРИЗА в последующий период. -- По вашему мнению, возможен ли такой вариант? Т.е две большие партии для того, чтобы преодолеть национальные проблемы, как они их называют, могут стать компаньонами? Вы видите такую возможность? -- Куда приведет это недовольство? Есть большая масса людей, которая в настоящее время обеспокоена, задумывается, недовольна политикой СИРИЗА, но в то же время она недовольна политикой, которую проводила НД, не хочет отдавать свой голос ни за НД, ни за ПАСОК, политику которого она также видела на протяжении многих лет, а значит, беспокоится, негодует, участвует в борьбе. Это находит выражение в выборах руководящих органов профсоюзов трудящихся частного и государственного секторов. Силы, поддерживаемые КПГ, являются второй силой в широком профсоюзном движении, получившие более 20% голосов, влияние партии сильно среди молодежи, в студенческих профсоюзах, в школьных советах, так как ученики 11-х и 12-х классов греческих школ сегодня могут голосовать на основании нового закона, и, конечно, ее влияние сильно среди крестьян. Мы призываем эти народные слои (это более 20%), с которыми встречаемся в процессе борьбы, голосовавшие раньше за СИРИЗА, ПАСОК, возможно, и за НД или за другие маленькие партии в знак недовольства, примкнуть к КПГ, даже если у них есть чувство настороженности. Так как предложение КПГ является единственным предложением, которое может дать выход из сегодняшней ситуации и открыть путь к лучшему будущему. И это предложение должно быть поддержано везде: в народном движении, в борьбе, а также тогда, когда проходят выборы - будь то парламентские, муниципальные, региональные или в Европейский парламент.